This year is ArtStarts' 20th Anniversary. As we celebrate our accomplishments and impact, we are also inspired to think ahead about what the next 20 years hold for young people. What role can art and creativity play to support our next generation to thrive in the future? To help us explore this question, we sat down with 20 community leaders across different sectors and asked them to share their story and thoughts on the relevance of art and creativity. Over 20 weeks, we'll share these stories with you. We hope that they will inspire you to join our community of supporters so that together we can continue to build a bright future for BC's young people. This week's community leader is Geoff Cross. 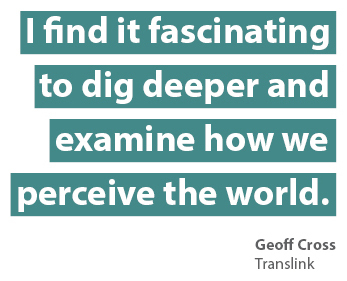 Geoff is the Director of Strategic Planning and Policy with Translink. Through his role, he looks at transportation planning and place making which involves developing, managing and funding public transit, roads and bridges in Metro Vancouver. Creativity is about how you look at problems and looking at all of the options before tackling a problem. It is also about empathy. I believe creativity includes the ability to put yourself in someone else's shoes and think from a perspective other than your own. What does creativity look like in your life? Due to the amount of information we receive and have to digest, I depend on my creative thinking in order to communicate effectively with people. My workdays are packed and sometimes it gets to be too much to be constantly doing—I need time to reflect. I have the benefit of having built in reflection time during my Skytrain commute each day. Having time to reflect has become an important part of my creative process. Testing conventional wisdom. It is easy to accept things as they are, but I find it fascinating to dig deeper and examine how we perceive the world. What encourages the development of creativity? There are certain physical conditions like space—people need to be able to congregate to share ideas. You also need time, time to incubate. What inhibits the development of creativity? The way we measure success affects the ability for creativity to thrive as it can either be about just getting things done or about getting things done in the most effective way possible, which encourages greater accountability. What do you remember about school? I grew up just outside of Ottawa in a small town and I have nothing but spectacular feelings about my school years. My school days were jam-packed and full of stimulus and they have definitely shaped where I am today. I remember the academic part as well as the friendships and I remember how physically active we were—we would end each day totally exhausted. Do you remember a favourite teacher? Mr. Canuel—he was my history and social studies teacher and he showed an incredible passion for the subject. He was tough and stern but also very loving. It wasn't just by rote that he taught, he really tried to help us make sense of what we were learning and have it resonate and allow us to discover how we could apply what we were learning. What skills do young people need to thrive in the future? Young people need to be resourceful and resilient to thrive in the future. My own career has had multiple tracks, and shifting paths many times is much more accepted now and will be the norm in the future. In an economy that is in rapid transition it might mean more testing and perhaps some false starts, but do not be dismayed by this, rather embrace it and recognize that there is always a lot to learn through the process. Any specific advice for young people today? I always remind myself and others that I work with that we don't know nearly as much as we think we know. Be aware of your own biases and every so often shift your perspective and consider things from someone else's point of view. At ArtStarts in Schools, we want to ensure that young people across British Columbia have opportunities to develop their passions and creative potential and to build skills to thrive in the next 20 years—and beyond. You can help us realize our vision by donating today and joining our community of supporters. Learn more about ArtStarts in Schools and the work we do and discover additional ways you can show your support. Keep up with the Next 20 interviews on Facebook, Twitter or Instagram. Sign up for our newsletter to get all the latest ArtStarts news.